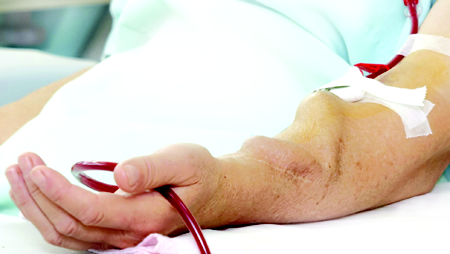 The hemodialysis patient’s vascular access is his or her lifeline. Successful hemodialysis depends on the health of the access. When an access fails, serious complications occur. Consequently, the vascular access has often been called the Achilles heel of hemodialysis. Yet, whether the vascular access is a graft, a fistula or a catheter, each type of access presents potential complications which, depending on their severity, ultimately affect the patient. Infection and sepsis, the major causes of morbidity and mortality in dialysis patients, are the most frequent vascular access complications. Because vascular access problems in hemodialysis patients remain a leading cause of patient morbidity, proactive management of the access is crucial. Conscientious providers have implemented multi-disciplinary vascular access care programs to proactively address access-related problems in order to forestall morbidity in their patients. Central to a vascular access care program is a fully integrated access surveillance program provided by flow-based Transonic Hemodialysis assessment of vascular access patency, dialysis adequacy and cardiac function. Lok CE, Foley R,“Vascular Access Morbidity and Mortality: Trends of the Last Decade,” Clin J Am Soc Nephrol 2013; 8: 1213-1219. Lok CE, Mokrzychi MH, “Prevention and management of catheter-related infection in hemodialysis patients,” Kidney Int 2011; 79: 587-598. Schwab S J, Hemodialysis vascular access: The Achilles' heel remains, Kidney International (2007) 72, 665–666.